The acronym stands for Case Management / Electronic Case Filing. CM/ECF is a comprehensive case management system, developed by the Administrative Office of the U.S. Courts in 1996. The system allows courts to maintain electronic case files and offer electronic filing over the Internet. Courts can make case information immediately available electronically through the Internet. Most documents prepared for filing are now created in electronic form. CM/ECF allows the federal courts to take advantage of modern technology to reduce reliance on paper records, streamline processing, enhance accuracy, reduce delays in the flow of information and achieve cost savings for the judiciary, the bar and litigants. What is the cost of using CM/ECF? There is no fee for an attorney to register to become an e-filer. There are no additional fees associated with filing electronically, however existing document filing fees still apply. What are the benefits of using CM/ECF? Attorneys registered to use CM/ECF can file documents 24 hours a day, 7 days a week. Unprecedented access to case information is available immediately to attorneys, parties, and the general public through the Internet. 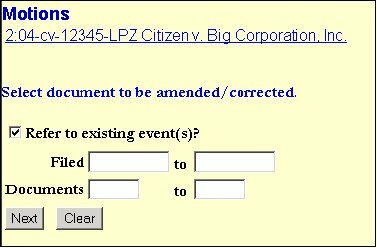 Attorneys registered to use CM/ECF will receive email notices electronically in CM/ECF where they are listed as attorneys of record. Court dockets are immediately updated when an attorney electronically files documents. Filing can be done from remote locations. What else do I need to know before e-filing? Each district court in the U.S. adopts its own policies and procedures for electronic filing. In the Eastern District of Michigan, the ECF Filing Policies and Procedures were adopted and apply to all filings in accordance with LR 5.1.1. Every attorney e-filing in this district is expected to be familiar with them. Are there any exceptions to what can be e-filed? Yes. Documents that are not to be electronically filed are listed in Rules 6 and 7 of the ECF Policies and Procedures. What hardware and software are needed to use CM/ECF? How secure is the CM/ECF system? CM/ECF has many security features and was deemed secure by the National Security Agency. PDF documents cannot be altered once they are filed with the Court. All documents are assigned a unique electronic identification called an electronic document stamp. This is recorded in the Notice of Electronic Filing. How do I find out who is receiving electronic notices so I can prepare my Certificate of Service accordingly? Log into CM/ECF and click on Utilities->Mailings->Mailing Info for a Case. Enter the case number. Is a Certificate of Service required when a document is e-filed or does the NEF serve as proof? A certificate of service is still required, but now each certificate should state how each party was served – traditionally or electronically, via CM/ECF. Your certificate of service should be the last page of the document or included on the last page of the document you are filing. It should not be a separate electronic filing. I am filing a motion and I have a notice of hearing to accompany it. How do I file it? A notice of hearing prepared by the attorney is not necessary. Hearings on motions will be held according to Local Rule 7.1. If I already have a login and password to e-file in another district court, am I still required to complete online training to receive a login and password for the Eastern District of Michigan? Yes. While CM/ECF is similar in all districts, local changes are made to the system, and policies and procedures differ from court to court. Completion of our online training will familiarize you with the features, enhancements and policies of the Eastern District of Michigan's system. Can any member of the public register to e-file documents with the Court? Yes. Attorneys are required to electronically file documents and pro se litigants have the option of applying for a login and password to e-file and receive electronic notification of filings in their cases. You can obtain a copy of the Pro Se Application for Electronic Filing here. Can an attorney authorize someone in the attorney’s office (such as a paralegal) to use the attorney’s login name and password to file documents in CM/ECF? Yes, but access should be limited and controlled since whatever is filed under that login and password is deemed to have the attorney's signature on it. I have applied for admission to practice in the Eastern District of Michigan and have done everything except be sworn in. Can I register to e-file now? No. Effective July 1, 2012, attorneys must be admitted to practice and receive the Oath of Office before being issued an e-filing login and password. If you applied for admission prior to July 1, 2012, you may register on the court’s website for an e-filing login and password. If your name does not appear when trying to register, contact the Clerk’s Office at 313-234-5000, and choose the option to speak to the ECF Help Desk. I am attempting to register and when I enter my name and MI Bar number, my name does not appear. What do I do? Try entering your name without the Bar number, or try entering the Bar number with/without the P. If your name still doesn’t appear, call the help desk at 313-234-5042. While registering, I am asked to choose between HTML and Text versions of Notices of Electronic Filing. What do I choose? That depends on what type of email application you have. If you have the ability to click and open hyperlinks contained in the body of your emails, then you should choose HTML. If you are unable to click and open hyperlinks from emails or if you are unsure what to choose, select the text version. Text is accepted by all email applications. With text version, you will need to copy and paste a URL address into the address bar of a web browser to view the document in a separate window. I am an efiling user and would like to add a secondary email to my account so someone else can also receive notification when activity in my cases occurs. How do I add or change the secondary e-mail? A secondary account can be added at the time of registration for a login and password. If the account has already been created, the registered attorney can add an additional email address by logging into CM/ECF and clicking Utilities -> Maintain Your Email. For more information see ECF User's Manual. Can I change my log-in and password? If my contact information changes or if I move to a new firm, how do I notify the Court? Each filing user is responsible for maintaining valid contact information in his or her ECF Registration account profile. When a user's contact information changes, the user must promptly update his or her CM/ECF account. If the filing user has a pending case before the Court, the user must also promptly notify all parties in all cases. Electronic service upon an obsolete e-mail address will constitute valid service if the user has not updated the account profile with the new e-mail address. Can support staff take the training? Yes, it is recommended that both attorneys and support staff complete the training and familiarize themselves with the ECF Policies and Procedures. Can the online training be done more than once? Yes, it can be repeated as many times as desired. Is there a '"How to" guide available? Yes, the Electronic Case Filing User's Manual provides in-depth information and instruction on electronically filing documents such as motions, responses, etc. What is a courtesy copy of an e-filing and how should it be handled? One “courtesy” or “chambers copy” of all dispositive motion papers, as defined in E.D. Mich. LR 7.1(d)(1)(A), (including responses and replies) and all accompanying exhibits must be submitted directly to the judge’s chambers on paper. Any exhibits must be properly tabbed and all papers firmly bound, usually along the left margin (“book-style”). Good practice requires that in appropriate cases, relevant portions of lengthy documents be highlighted. A printed copy of the Notice of Electronic Filing must be attached to the front of the paper. I need to e-file this document but I am unsure what event to use (what to call the document). What should I do? On the Civil and Criminal Events Menus, there is a search option. Use this to search for keywords to locate the appropriate event. If you are still unsure about how to file your document, call the help desk at 313-234-5042. I am filing a Motion with the required brief and Certificate of Service. Are they 3 separate filings? No. The motion, brief and certificate of service should be submitted as one electronic filing. LR 7.1(c)(1)(A) requires that motions be accompanied by a brief. Therefore, when filing a motion, the brief and required certificate of service should be contained in and filed as one PDF document and filed under the category "Motions." 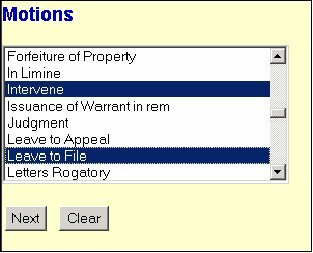 How do I select more than one relief when filing a motion? Click and highlight the first relief. Hold the "Ctrl" key down on your keyboard and click on any subsequent reliefs with your mouse. Each will be highlighted in blue. See figure 1. I am filing a document on behalf of more than one party. When I am at the "Party Selection" screen, how do I highlight more than one? Hold the “Ctrl” key down on your keyboard and click on each of the parties filing the document. Each party should be highlighted in blue. I tried to upload a document into CM/ECF, but I get a message that says "document is not a well-formed PDF" — what is the problem? This error message can appear for a number of reasons. The document is not a PDF document. The file must have an extension of ".pdf". The PDF file has password protections or digital signatures. The ECF system does not accept PDF documents with these features. All documents must be signed with an s/ signature or a paper document must be scanned and made into a PDF file. If the PDF document has control permissions that require a password or a digital signature, the user must reformat the file before e-filing. The file selected was mistakenly the word processing version of the document. The user needs to click on [Browse] again and select the appropriate PDF file. The full path name for the PDF file isn't represented. A user shouldn't type in the "Filename" box, the user should click on [Browse] to select which file should be uploaded. When the system displays the '"Refer to existing event?"' screen, what is it asking? I clicked on the NEXT button at the "Final Docket Text" screen and the Notice of Electronic Filing did not come up. I also didn't receive an email notification. How can I verify that my filing went through? Click on "Utilities" and click on "View my Transaction Log." This feature allows you to select a date range and will display all filings made using your login and password. If the filing in question is listed, the court received the filing. If it is not, the document did not go through and must be re-filed. 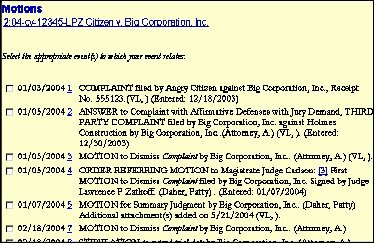 For voluminous filings, portions of the docket text often appear truncated when viewing the log. The actual Court record includes the entire filing. Another way to check if the Court received the filing is to run a docket sheet report. While filing, I hit the back button in my browser and the system said items couldn't be displayed. Now what? This usually happens if you hit the back button on a screen after selecting the filename for the pleading you are trying to file. Click on a link in the Main Menu Bar to start the filing process over. Why will CM/ECF occasionally fail to show the correct menu options, or begin acting strangely after it has worked for some time? Instead of getting information from the Court’s server, your computer may be trying to load the page using its temporary memory. Right click in the window and select Reload Frame (Netscape) or Refresh (IE). If that does not bring back all options, clear your cache or temporary internet files. At this time, the Eastern District of Michigan allows a user to pay for filing fees online using a credit card if the document requiring the fee can also be submitted online. An example would be a Notice of Appeal. I am filing a document with numerous, voluminous exhibits. How much information can I e-file at one time before I run into problems? You can e-file numerous, voluminous exhibits, but you may have to file the exhibits as multiple group filings. Try to keep the total file size of a group of PDF documents below 50MB. (The system does not accept any one PDF file larger than 15MB, so any single exhibit larger than 15MB must be divided into parts.) If you have a slow modem or slow Internet service, you may want to keep the total file size below 30MB. For more detailed information, consult the ECF User's Manual. I just filed a document and forgot to attach the exhibits. How do I make my exhibits part of the court record? Do not re-file the document you just filed to add the attachments. Instead, go to the Civil Events screen and select "Other Documents." Then highlight the event "Exhibit." Start with your first exhibit or Index of Exhibits as the Main Document. Underneath the Main Document are several blank lines to upload each individual exhibit. As you proceed with the filing, a new attachment line will appear at the bottom allowing you to add multiple exhibits. It is recommended that you keep your total submission under 50MB to reduce the risk of the system timing out before completing the transmission. You will also be asked if this filing refers to an existing event. Check the box so you can link the exhibits back to the filing they relate to. Be sure to adequately describe your exhibits by entering a narrative description for each exhibit. For more detailed information see the ECF Filing User's Manual. I need to submit a Stipulated Order to the judge for his/her signature. How do I do that? A stipulated order is not converted to PDF; it must be a format compatible with WordPerfect. The stipulated order is electronically submitted to chambers using a link under "Utilities" called "Proposed Orders." Do not e-file the unsigned order. Only the judge can cause an order to be e-filed. For detailed instructions, refer to the User Manual. Public Access to Court Electronic Records (PACER) is an electronic public access service that allows users to obtain case and docket information from Federal Appellate, District and Bankruptcy courts, and from the U.S. Party/Case Index. Users can access court records from the Eastern District of Michigan, but PACER is a separate entity, requiring a login and password separate from this district’s ECF account. PACER provides tutorial information. To register, visit PACER’s web site. Are there fees to access docket sheets and documents through PACER? Yes. The most current fees are explained on the PACER web site. The firm PACER account can be used for the query and viewing of case information in CM/ECF. However, if you would like to keep the billing separate from the firm's, you will need to establish a new PACER account. This login prompt is requesting your PACER login and password, which is required whenever you request a report or document from a case. In order to bypass this login prompt in the future, click the box that says ‘make this my default login' after entering the PACER login and password. However, your CM/ECF login and password will still need to be entered each time the ECF site is visited. I am trying to view a criminal document and the system says I do not have authority to access the document. Why not? As of November 1, 2004, criminal case files are available to the public from remote locations via PACER. Before that time, criminal documents could only be viewed by attorneys of record in the case. If you are attempting to remotely access a document filed before November 1, 2004, you must be an attorney of record in the case. CM/ECF requires a user to first enter the court-issued login and password to identify the user as an attorney on the case and then requires the user to enter a PACER login and password. If you are not an attorney of record on the case, the document can only be viewed at the Courthouse. Access to documents in the Clerk’s Office remains unchanged. I am the attorney of record and I still cannot view a criminal document filed before November 1, 2004? 2. Login to the system using your court-issued login and password. 3. At the Welcome Screen, click on Reports and select docket sheet. 4. A second login screen should appear. If it does, enter your PACER login and password. Notice that the top of the login screen only reads PACER login. Are answered at the PACER web site. I received an NEF where the docket text identifies it as a Minute Entry. Why isn't a document or document number associated with it? A minute entry is an event on the court docket that records an activity in the case, rather than a filing made in the case. The most common minute entries reflect hearings or conferences held before the judge or of a trial being held. I'm a filing user and I am not getting Notices of Electronic Filing for one of my cases. Why not? The most common reason this happens is that the attorney is not listed on the Court docket as an attorney of record in the case. To verify that you are the attorney of record on the docket, log into CM/ECF, click on “Utilities” from the main menu bar, click on “Mailings”, click on “Mailing Info for a case” and enter the case number. If you are not listed as a filing user in the case, that is the reason you are not receiving Notices of Electronic Filing. I am listed as an attorney of record in my cases and I am not receiving email notification for any of my cases. Why? A reason for this issue relates to "spam filtering." Check to see if "spam" filtering is turned on in the email program. When email notifications are sent out, the attorney's email address is in the bcc field and is therefore mistaken for "spam" by some junk-mail filters. If the user has a Hotmail account, Hotmail will automatically delete suspected spam unless a setting is changed. You will need to add "mied.uscourts.gov" as an accepted domain in your "spam" filtering software. I accidentally deleted my Notice of Electronic Filing from my inbox. Where can I get another copy of an NEF for my files? A Notice of Electronic Filing can be retrieved from the Court docket, but the filing user must enter his/her E-filing login and password first, then the PACER account information to retrieve the docket. When running the report, check the box to include Notices of Electronic Filing. On the docket report, click on the silver ball next to each filing to view the NEF.